Merry Christmas everyone! I hope that you all had a fab christmas I certainly did and I was so spoilt. 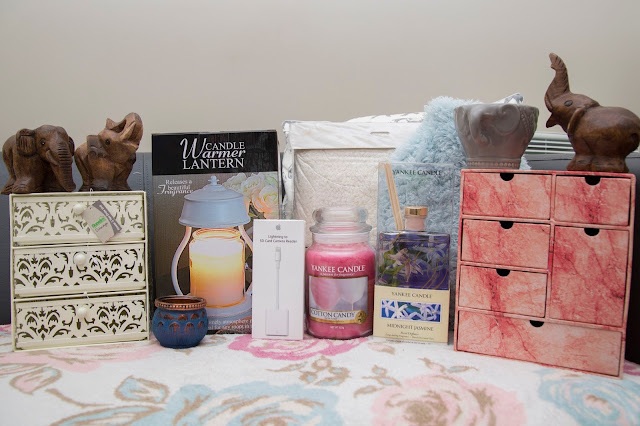 Today I am going to show you some of the wonderful gifts that I received from my friends, family and boyfriend. I am in no way bragging, I just wanted to share them with you as I love finding out what other people get as to me its just like a haul. 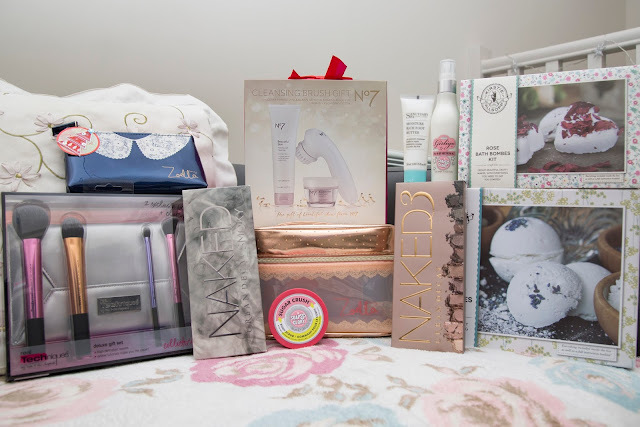 I was lucky enough to get a variety of presents, therefore I have split them into three sections; home bits, beauty bits and cocktail bits. Firstly here I have my home bits. If you didn't already know I love elephants and I got multiple elephant themed presents, here are a couple of my ornaments and a cute mug. I love candles and fragrance but I am not allowed to light candles in my flat, which is why this candle warming lantern is amazing, as it allows me to melt them without a flame. The Yankee Candle I received is one from America and has a Cotton Candy scent, it smells AMAZING. I also got a reed diffuser in the classic scent Midnight jasmine ,which I think I am going to put in my bathroom. The next lot of gifts are all beauty themed. Yes that is two Naked palettes and yes I was overwhelmed when I opened the first one let alone when I opened a second. I have wanted these palettes for who knows how long and am extremely grateful to now own them. I also got some D.I.Y bath bomb sets which are really cool, definitely going to do a post and maybe a video with them! Got some make up bags and brushes which are always super handy. I am also really excited about my No7 Cleansing brush, I've used it a couple of times and loving it already. The last section is cocktail/alcohol! These people obviously know me very well and how much I love cocktails. In the middle is a really cool device that helps separate the colours when trying to make fancy looking drinks, I cannot wait to try this out! 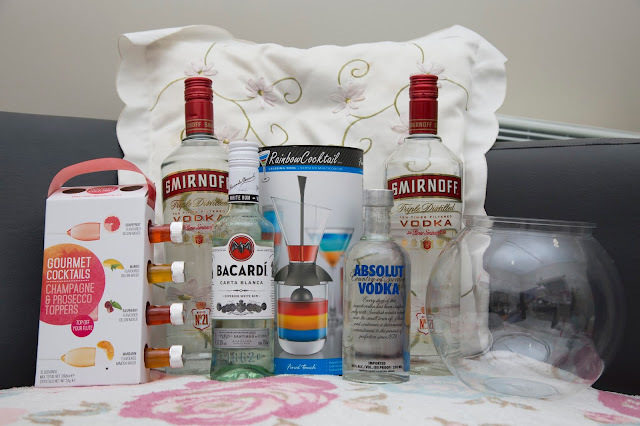 I also got some different flavoured mixers that sound delicious and of course some alcohol to go with them. That is definitely me stocked up for quite a while. Some other presents I received, but do not have on me to share with you, are some really cool Game of Thrones cushion covers they are honestly amazing each one has a different house sigil on it. I also got a Game of Thrones colouring book and some other normal ones. Multiple Lush items, more candles, a lovely big canvas with an elephant design on it, a backdrop for my photography and much more. I love all my friends and family so much and cannot believe I received so many wonderful things. I hope that you got some lovely gifts too or at least had a wonderful time over the holidays. See you in the new year!